I’ve been promising ya’ll a mozzarella recipe for a while now and it’s finally here! There are a million-and-one mozzarella recipes out there, including ones that use microwaves and citric acid as short-cuts. 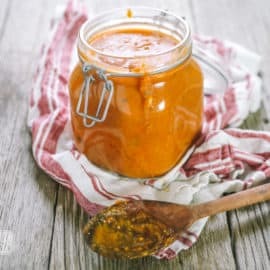 But, I have personally settled on this traditional-style method because it consistently gives me an end result with good taste and good texture. This recipe basically takes all day, from start-to-finish. 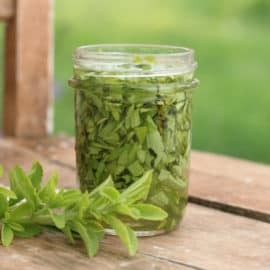 Now, before you say “No way!”, keep in mind that you don’t have to be in the kitchen all day— there are just a lot of waiting periods– so if you have a timer that you can carry with you, you can definitely still head outside to work in the garden or barn during the cheesemaking process. 4. It freezes well. 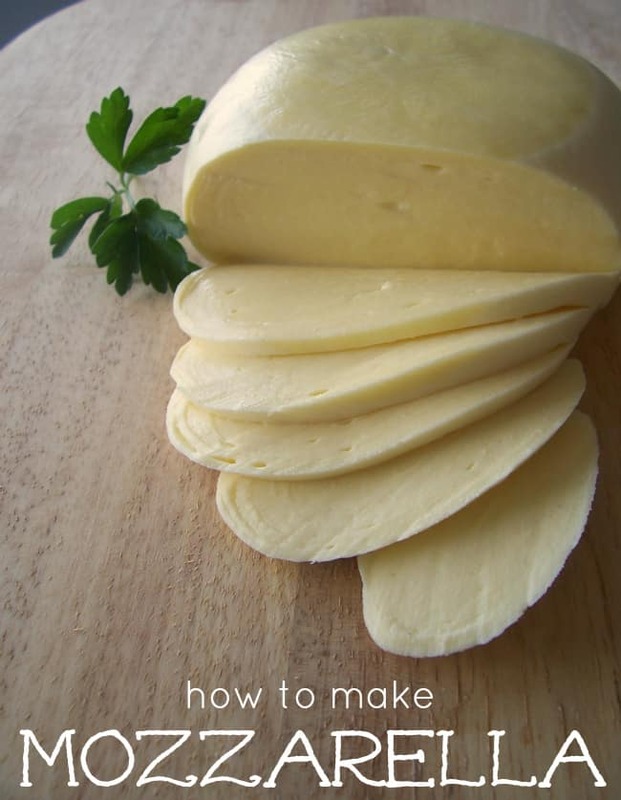 Make a bunch of mozz when you’re swimming in milk and freeze it for the times when your animals are dry. Thermophilic Starter Culture– This is what will culture the milk. I get mine from Cultures for Health. I like the direct-set variety- just because I don’t have time to propogate cultures. Rennet– I get the double-strength vegetable rennet from Cultures for Health. There are many varieties of rennet available- tablets or regular strength rennet is ok too– but steer clear of the “Junket” stuff at the grocery store. 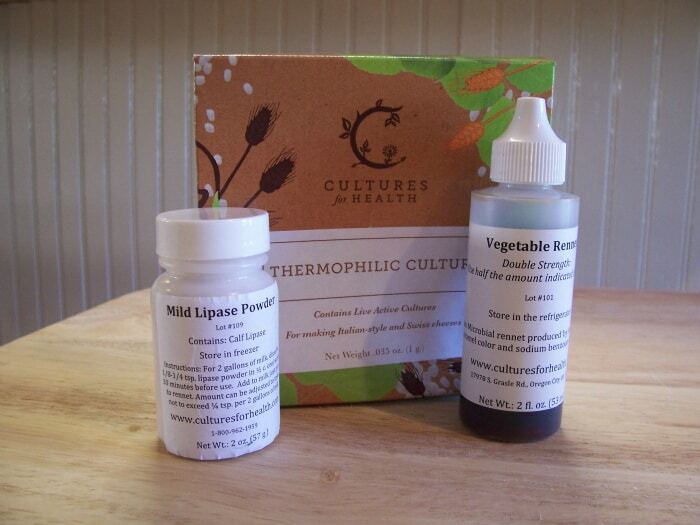 Lipase– I also get this from Cultures for Health (I get the Mild Calf Lipase). This is a totally optional ingredient, but I like to use it since it gives the cheese more depth of flavor. And I figure if I am going to all the trouble of making homemade mozzarella, it might as well taste as good as possible. Milk— I use my raw cow milk, but goat milk will work as well. You can use pasteurized milk if you must, but try to purchase the most high-quality, whole milk that you can afford. 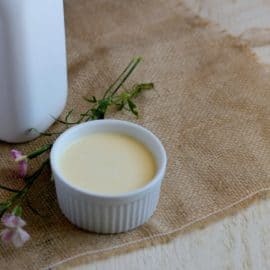 Sometimes I lightly skim the cream from my gallons of raw milk (if I happen to be low on cream), but otherwise, I like to use full-fat milk since it gives the best flavor. A timer- preferably the portable kind. Or, use the timer feature on your cell phone. Make sure all of your equipment is extra clean, since this will be a sorta-raw cheese. Way to go! We stopped at a farm on a tour of Italy to watch them making mozzarella in big bowls, kneading the whey out and then hanging. Was my first first-hand encounter with cheese making. Oh– I’d love to see them do it in Italy. How awesome! Looking forward to the next post on this. I’ve been slowly working my way into cheese making and I’ll be placing another order from Cultures for Health this weekend. 🙂 Thanks for this topic! How much cheese will this end up making? Thanks for posting this. Very timely as cheesemaking is currently a topic of discussion in our home. Our challenge right now is saving enough milk from the does – our 2 goat kids and 8 human kids drink most of it up! Sigh. Can’t wait for part two of this one. Great post…i was however stoping by for this weeks barnyard hop and cant locate it. Im an avid reader of your blog thanks for all thr hard work. I have a friend that makes goat cheese all the time…..I will have to ask her if she has made Mozzarella. How fun! Ooooh, I can’t wait for the recipe! I’ve been wanted a more raw version. And I really appreciate all your little tips of why you use this instead of that. Nothing like someone else’s experiences to learn from! And after you make mozzarella will you make Ricotta with the whey? Yep- I definitely do that sometimes! If I don’t need any raw whey, I’ll heat the whole pot to 200 degrees and strain it– makes wonderful lasagna! Should I use my freshest milk or my oldest? I get about a gallon a day and normally drink the oldest first. Can I use that- 3-5 days old- or do I need to use the most recent? I personally try to use my freshest– it seems as though I have the most consistent results that way. Although I most definitely have used older milk too. I’d say 3-5 day old milk should be just fine. ok. I am going to start a batch in the morning and I think i will use my freshest. I have a few quarts that are older than 5 days, probably over a week. I don’t remember exactly. I think I will just toss those few in the freezer for the piglets when we get them. I don’t want to risk ruining my cheese. I am wicked excited about trying your recipe though! 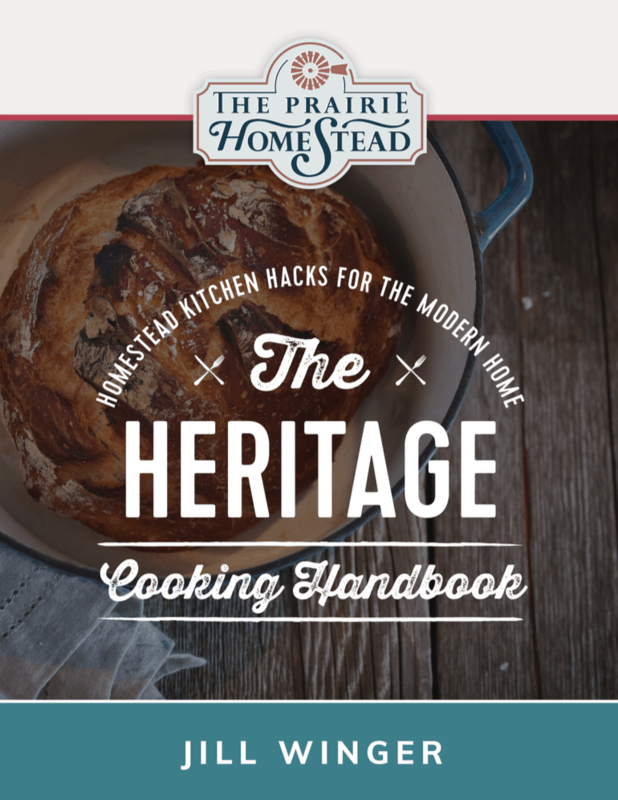 You know how you said at the beginning that you don’t tend to follow recipes very closely? I have the same problem. I sort of followed it and I no have 2 balls of something that looks like mozzarella cheese. Haven’t tasted it yet but it looks yummy! 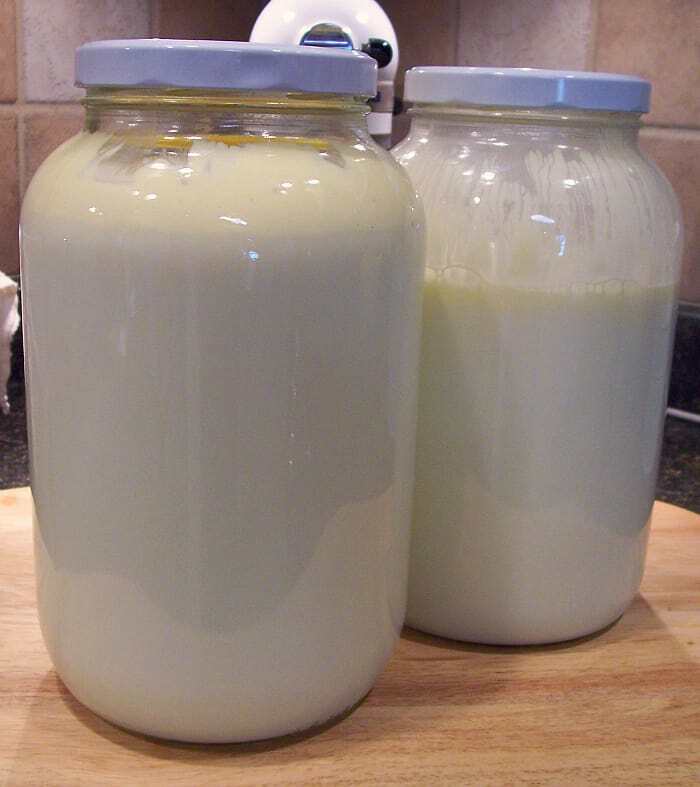 I just made my first batch of mozzarella with fresh goat milk. 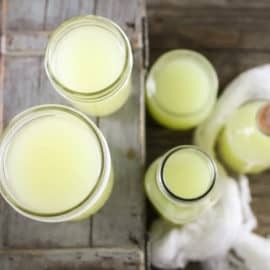 I used another recipe with the citric acid. The cheese seemed to turn out okay but it has a strong (almost soured) flavor. I didn’t remember mozzarella in the store as having a strong flavor. Is that from the citric acid or do you think it could be something else. I didn’t have a stainless steel pot so I used one with a teflon coating. Any ideas? Thanks P.S. I might try again or I might try your recipe next. Hmmm… How old was the milk that you used? Was it more than a couple days old? That might have caused the sour taste. Mine definitely has more flavor than the storebought stuff, but it usually doesn’t taste sour. I think the milk was about 3 days old or maybe 4 but it still smelled good. I will use the freshest next time and see if that makes a difference. I don’t know if I used the right word for describing the taste. It doesn’t taste like soured milk smells but that was the closest thing I could think of. It has a strong taste almost like when people think of a strong taste from wild game. Anyway I will try again one day this week. Does it really make a difference what kind of pot you use? Is it bad? Artificial? I just want to know why. just wondering why you dont order the Organic vegetable rennet? I don’t want Propylene Glycol in my cheese! I usually use the vegetable rennet from CFH? I wasn’t aware of any propylene glycol? This is the one you buy: Ingredients: Enzyme produced by pure fermentation of Mucor Meihei in salt brine, less than 5% propylene glycol, less than 2% sodium propionate. This is the organic by CFH: Ingredients: Double-strength microbial “vegetable” rennet derived from Mucor Miehei and sodiumchloride (Danisco Marzyme 55 PF). Interesting interpretation of the process. I would love to try this out and see how it tastes. I interned for a cheese house in Tuscany for 12 weeks this past summer and we made primarily pecorini and caprini freschi but we made in total 42 cheeses, including mozzarella, which was my personal favorite cheese to make. So much fun, and can’t beat fresh mozzarella the day it is made. why steer clear of the “Junket” stuff? I’m curious about why you say not to use Junket tablets. I find it easy to access junket tablets, and have just successfully made cottage cheese with them. They also have a recipe for mozzarella, but I haven’t tried it yet. What is wrong with Junket tablets? I’ve never had consistent results with Junket– especially not in this particular recipe. Could a digital crock pot be use tok heat and hold the different temperatures? Maybe with the lid off? I think there has to be some dodad to heat and hold the temp instead of turning my stove on and off. Maybe an Insta pot?